Love the unexpected bokeh in this otherwise not terribly interesting shot. If we only had a few daisies or something this might have turned out well! You are probably like me and think that while the kids are young they need the garden ..our entire tiny patch is covered in a trampoline and a swing. Time enough for fancy planting when they've moved out. Agree with Sian.....gardens are for the kids when they're young...only now am I developing a 'proper' garden. You've still managed some interesting shots. Great shots...makes me think I'm glad I'm not tiny..that world down there would scare me!! I knew you'd have fun with anything that involved laying on the ground with your camera! 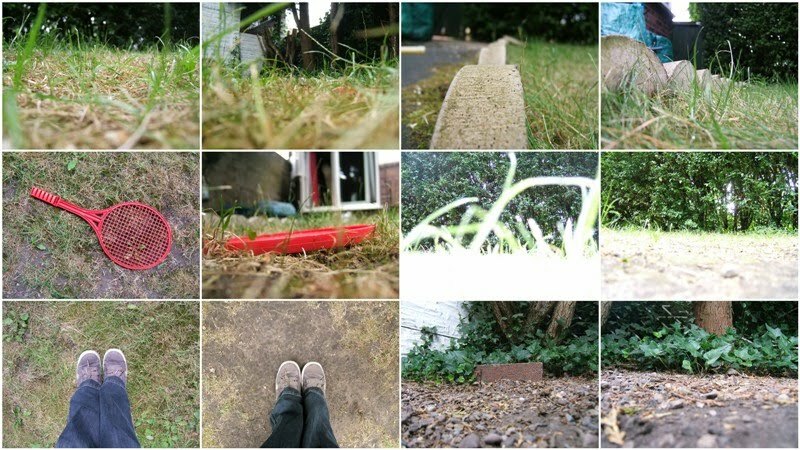 I think we all have lawns looking in the same condition. And I don't even have the 'young children ruining it' excuse! Looks like you're enjoying all of that experimentation! I love 'down low' shots and often take them - because I can't be bothered using a tripod either! I'm loving all these photo collages on everyone's blogs. Your garden reminds me quite a lot of our garden. I'm just rubbish at keeping plants alive.